The fluid-mosaic model describes the plasma membrane that surrounds animal cell. The membrane has 2 layers of phospholipids (fats with phosphorous attached), which at body temperature are like vegetable oil (fluid). 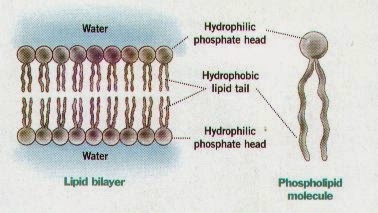 Because cells reside in a watery solution (extracellular fluid), and they contain a watery solution inside of them (cytoplasm), both layers of phospholipids (1) have the hydrophilic heads (2) facing outwards into the water and the hydrophobic tails (3) facing inwards, avoiding contact with water. 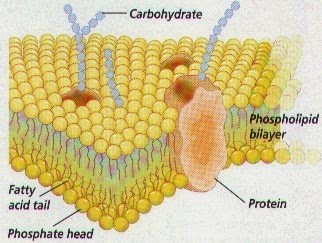 Cholesterol molecules are among the phospholipids. Protein molecules (4) float in the phospholipid bilayer. 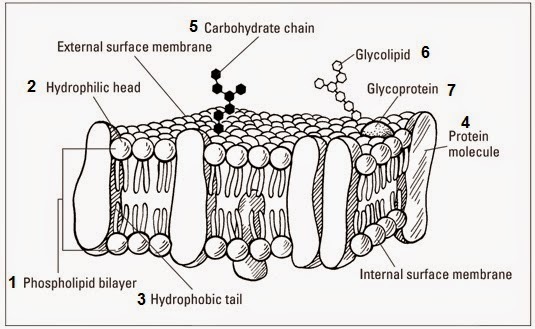 Many of the phospholipids and proteins have short chains of carbohydrates (5) attached to them, on the outer surface of the membrane. 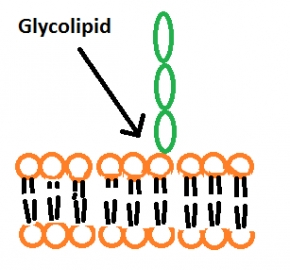 They are known as glycolipids (6) and glycoproteins (7). There are also other types of glycolipid with no phosphate groups. The fluid mosaic model of membrane structure. • 'model' because no-one has ever seen a membrane looking like the diagram - the molecules are too small to see even with the most powerful microscope. 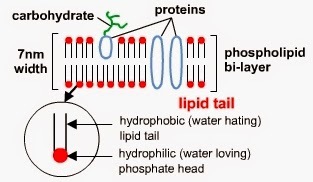 Have a hydrophobic head and a fatty acid tail --> form a bilayer separating the cell from the outside. They are fluid --> components can move around freely. Impermeable to large molecules and ions --> prevent these substances from passing thorough. Increases the stability of the membrane: sits between fatty acid tails --> making the barrier more complete, preventing molecules like water and ions from passing through the membrane. 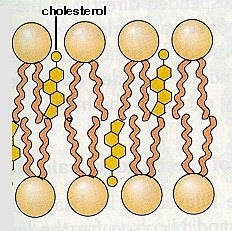 Without cholesterol the membrane would easily split apart. 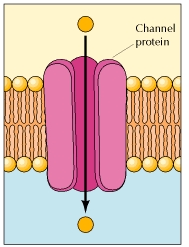 Channel proteins allow the movement of some substances, such as the large molecule sugar, into and out of the cell as they can’t travel directly through the cell surface membrane. The channels can be opened or closed to control the substances’ movement. 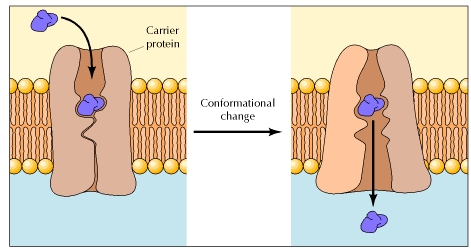 Carrier proteins actively move substances across the cell surface membrane, using energy from ATP. Cell surface receptors are glycoproteins responsible for the binding of an extracellular signalling molecule (hormones and cell surface antigens) and transduction of its messages into one or more intracellular signalling molecules, which changes the cell’s behaviour. Help to interact with other cells. Cell adhesion (adhese to neighbouring cells to form tissues). Structural, keeping the cell contents together. Allows cells to communicate with each other by cell signalling. Allows recognition of other external substances. Allows mobility in some organisms, e.g. amoeba. The site of various chemical reactions. The structure of cell surface membranes allows movement of substances between cells and their surroundings and allows cells to communicate with each other by cell signalling.